Gunungkidul is famous with the great beautiful beaches and the underwater world. One such place is Sadranan Beach in Pulengundes, Gunungkidul Regency, Yogyakarta, South Coast Java. Actually, tourists come to the beach to do snorkeling. 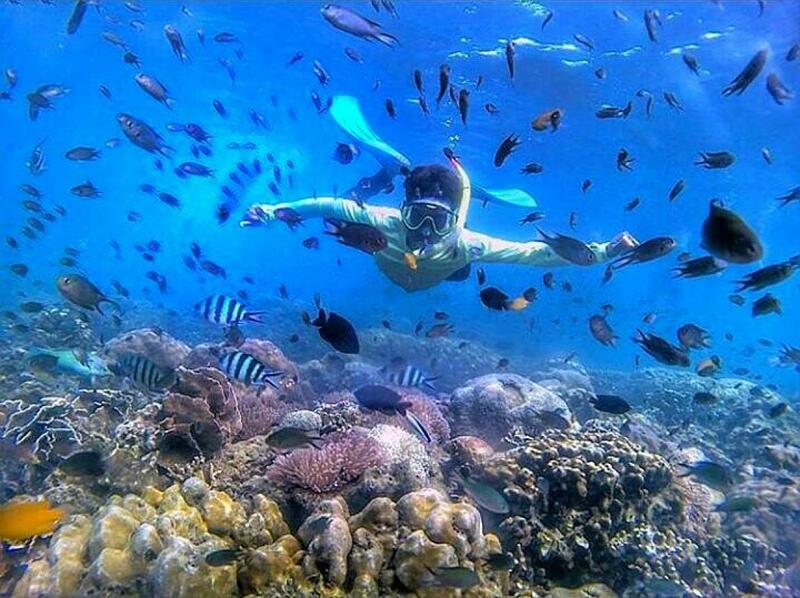 Sadranan snorkeling activity has popular in Jogja. Furthermore, there are many reasons why this place is recommended. The first reason is clear water. Commonly snorkeling is acceptable if the water clear. Fortunately, the water in Sadranan Beach is clear. This condition makes us able to see all the objects. Swimmers can see white sand, coral reefs, and fishes. It will be an unforgettable moment. Enjoy all the beautiful scenery clearly. To enjoy the underwater, make sure that you able to swim well. Moreover, this beach has white sand. A long coastline with white sand makes the beautiful view. Of course, the white sand gives a great contribution. The white sand causes the water to be clear. It is a great idea to play with the sand. There are many people come here with their children. The children spend their time to play with the sand. Then their parents can enjoy snorkeling activities. Besides the underwater scenery, the beach scenery is beautiful. Sadranan beach is surrounded by green hills. So, when people rise the head from the water, they can see green hills. These green hills are characteristics from the beach in Gunungkidul region. This region is a place that has many beaches and hills. It is like heaven. The coral reef is amazing things that we can find in this location. There are many beautiful coral reefs. Besides protecting the coastline, the coral reefs are home for fishes. Nevertheless, make sure that never destroy it. All the coral reefs are protected. It is very useful for this beach. Without these coral reefs, the waves rolling big. Most of the tourist do snorkeling because of colorful fish. They will see much colorful fish. Actually, fishes are such as clownfish. These fishes are small, colorful, attractive and photogenic. Tourists can bring their waterproof camera. They just can take pictures and get interaction with the fish. Do not catch the fishes. All the fishes and coral reefs are protected with the local people and government. Moreover, there are starfish and shrimp in here. Be careful when snorkeling in here. Sometimes, there are many jellyfish. Do not touch the jellyfish in here. Sadranan snorkeling is a great activity. In addition, the price to Sadranan snorkeling is cheap enough. There are many local guides in here. The local guide will give many instructions. They will make sure that the snorkeling activity is safe. So, do not afraid about safety. Visit Sadranan Beach and enjoy the underwater scenery.